Based in Iran. Ghanimat is a young indigenous Qashqai professional, specialising in Participatory GIS (Geographical Information Systems). 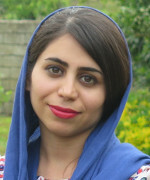 Ghanimat obtained her Bachelor of Science Degree in Natural Resources, specialising in Rangelands and Watershed Management at Shahid Chamran University, Ahwaz, Iran. She achieved the third rank among the approximately 900 people who took the entrance examinations for a Master of Science Degree in Rangeland Management at the top national university in Iran (University of Tehran). Ghanimat’s work with indigenous peoples and local communities in the context of the defence of their own territorial rights has mostly taken place at CENESTA, a founding member of the ICCA Consortium. Ghanimat helps communities to develop GIS maps of their territories, ancestral domains, and ecological assets; to understand trends of change; and to identify threats to their territorial integrity, such as land invasions, occupations, land- use changes, and land allocations by government agencies. Ghanimat is also active in ethno-botany (she is helping to establish a national tribal herbarium in Iran) and rangeland studies. She and her work provide inspiring leadership to all young scientists- in WCPA and other groups. She represents UNINOMAD/CENESTA in the Steering Committee of the Global Platform of Indigenous and Community Lands (LandMark).